Eloquent and eye-opening, this ground-breaking book is the first to give full voice to the wide array of real women behind the stock female images of World War II. From Wonder Woman to Rosie the Riveter, and the everyday heroes, and even a few villains, in between -- these are not your father’s war stories. Acclaimed by The New York Times as an “important new book,” and an example of “first-rate research and reporting,” and by The Washington Post as, “exceptionally well-written,” Our Mothers' War portrays women as equal partners in fighting and winning a war that forever transformed the way women participated in American society. 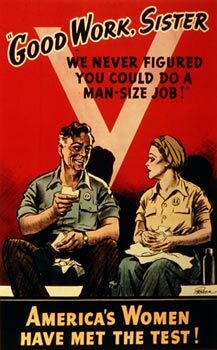 Readers will come to see the surprisingly vast scope of American women's experiences during that pivotal era. Our Mothers' War offers a comprehensive portrait of what American women from all walks of life were doing and thinking, on the home front and abroad. Sparked by finding a journal and letters her mother had written home from the Pacific while serving with the Red Cross, journalist Emily Yellin embarked on a broad investigation of how the women of her mother's generation responded to this time when their country asked them to step into roles they had never been invited, or allowed, to fill before. Drawing on a wide range of sources, including personal interviews and previously unpublished letters and diaries, Yellin brings to life intimate tales of women working as spies, war correspondents, disc jockeys, pilots, and prostitutes, as well of women building ships, planes and bombs, sending their husbands, brothers and sons off to war, and joining the military themselves for the first time in American history. 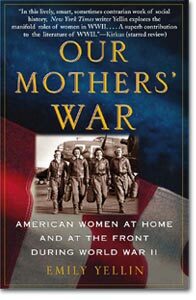 Our Mothers' War gives center stage to one of World War II’s most essential, but often overlooked, American fighting forces. If you have comments or questions about this website or the book, email emily@emilyyellin.com.